And the way the keys change throughout the song (while the melody remains the same) is the same as the BB theme. I'd be amazed if David Arnold had nothing to do with the CBBC theme also. 2) The break bumpers in this 1979 ad collection (see 2:02, 3:03 for examples), a region thing or not? Were these the earliest examples of a break bumper? Think those break bumpers were LWT. Rediffusion used these in the 1960s - they lasted in popular culture as a shorthand for an ad break for about 30 years after the station closed. I believe that these “graphics” between ads are actually called “break flashes”, whereas a “break bumper” appears at the start of the set of ads and often IDs the channel. David Arnold wrote the original 1994 CBBC theme, yes. (The 1997-era stings are based on that motif, but I'm not sure if David Arnold did these recompositions). I've always thought that the CBBC theme, Big Breakfast theme and Live and Kicking theme are happy bedfellows, as you say. Does anyone have the Liquid News David Arnold moment to hand? 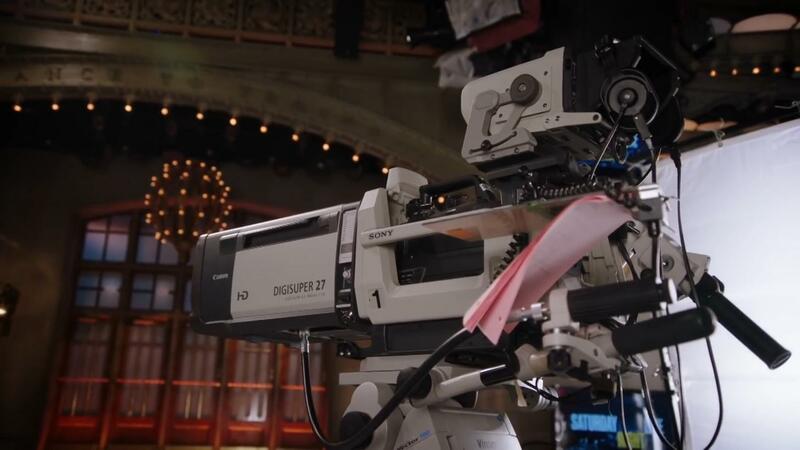 I’ve noticed watching NBC programs such as Saturday Night Live, Fallon and Seth Meyers along with other shows such as those on CBS that the box camera lenses are two tones. Usually it’s the front part of the camera that’s black and the rest is beige (Canon and Fuji seem to sell either beige or black only cameras). First is this a weird option (I’f purchasing I would want one tone), a salvage job done at the studio or done back at the service center? Also are cameras lenses user serviceable or do they have to be handled at a repair facility? Now I know cameras can be repaired to an extent at the station or studio. However lenses to me seem like a completely different beast where any imperfection and dust would affect the picture. I have not seen the lenses configured that way in the Today Show and for some MSNBC studio cameras but for fixed jobs they use the same DigiSuper 27. I’ve also seen the compact DigiSupee 22xs in use at MSNBC and Studio 3C for Nightly News along at many network affiliates (almost all every network O&O uses/used them. In that picture, the lens is all beige, the camera itself is black but the lens and its mount/cradle are beige and the camera sits inside it. The camera will have a standard mounting that can take much much smaller lenses, due to the size and weight of the big box zoom lenses they have a cage the camera fits into so it’s all correctly supported. Re the second point it depends on the fault. A lot of things tend to get fixed in house (speaking from personal experience at least) and some wear and tear you can keep on top of as you go. If a board dies most Sony cameras are very well designed internally allowing replacements to be fitted as needed. Lenses can be done in house, but as you've correctly said they require a much finer calibration and special tools to disassemble so these (again in my experience) do get sent of for specialist servicing as needed. (Canon and Fuji seem to sell either beige or black only cameras). Do you mean lenses? Canon and Fuji don't sell broadcast cameras. The cameras are usually Sony or GVG (aka Philips) with Ikegami, Hitachi and Panasonic also in the game (though in Europe it's really Sony vs GVG) whilst the lenses are usually Canon or Fuji. Sorry I meant camera lenses. But in that picture the front most part (a few inches) of the box is black where the rest is beige. When Canon has them on the website the lenses were completely beige. This is the same lens but the front portion is beige where the Canon logo vs black in the SNL pic. If you’re big enough, a valued customer, a customer you want to ‘win’ or have bought a lot of lenses in the past and likely to buy a lot more in the future, you’ll supply the lens packages in any colour the customer wants - fairy princess pink if that’s what they want. (And you’ll still offer a substantial discount on the list prices). Well NBC probably has a few dozen at 30 Rock, back in their old Burbank Studios (I think Universal City uses the XS lenses or the ENG style remote control), let alone all the ones used for sports. Plus all their ENG cameras use Canon lenses and they have the exclusive contract every Olympics for several hundred cameras just for NBC.